Chalet in Wieselti is a stylish self-catered chalet located in the heart of the Schanfigg Valley. The Chalet offers comfortable self-catered accommodation with stunning panorama views and is an ideal mountain location from which to experience a wide range of winter & summer activities. Situated in the traditional alpine village of Langwies, the cozy Chalet is ideally placed between the popular ski resort of Arosa (15 minutes by car) and Chur, the historic regional capital of Graubunden. The Arosa ski pass includes the train fare to Langwies station. In winter, deer are frequent visitors in the evening, and the chalet is in walking distance of the local village amenities. 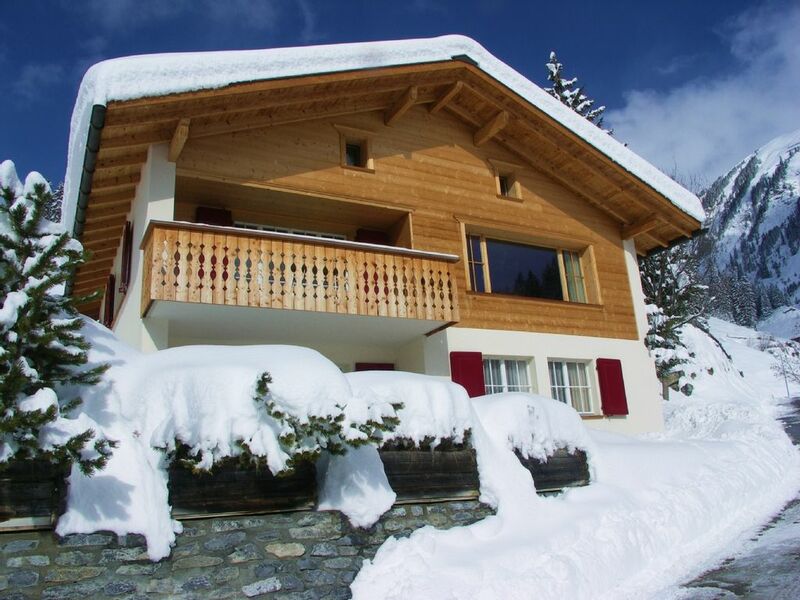 The Chalet is south facing, sleeping up to 10 comfortably - 2 bedrooms in the upper apartment and 3 bedrooms in the lower apartment, with options to rent the whole chalet or each apartment separately. Rates listed are for the whole chalet, please call to check for separate availabilities. The Chalet has 2 garage spaces, 2 flat screen TVs, DVD and Hi-Speed WiFi. Fresh bath and bed linen is provided and the the beds are made on arrival. Firewood is provided for cozy fires and well maintained roads allow easy access to the ski slopes in Arosa, the village shop in Langwies, or the sledging runs in nearby St. Peter. In summer, there is an outdoor BBQ on the terrace. If guests prefer they can use the local train. The station is 10 minutes walk and has regular connections to Arosa and Chur. The ticket to Arosa is included in your ski pass! Arosa is 150km or 1.5 hours by car from Zurich International Airport. The local shop, restaurant, hairdresser and tourist office are all within 10 minutes walking distance from the Chalet. Assistance is always nearby in the form of René, our friendly caretaker, who is available at (nearly) all times to help with any questions our guests might have relating to either the Chalet or the local area. In the interests of all our guests, pets are not permitted and we ask that guests do not smoke inside the Chalet. I stayed in the chalet for a week in July with 11 friends. We had a lovely time! The manager met us at the train station and brought our luggage to the house. The house is well-equipped with plenty of dishes and utensils for a week of cooking. We thoroughly enjoyed the view from the balcony upstairs, and ate our breakfast there usually. There are many opportunities for hikes in the mountains, as well as a short train ride to the town of Arosa. In Arosa there is a gondola to a restaurant and a panoramic view of the alps. It is also a short ride to Chur, which has many cultural opportunities. We had a delightful dinner in the next town, Litziruti. Some members of our group took short walks along the river, and others of us walked for hours in the mountains. We found that there was more to do than we had time for. We would happily return for another vacation! Great stay in a very comfortable chalet! We stayed at the Chalet im Wieselti with our extended family (10 people in total) and had a great week. The chalet was very comfortable and could easily accommodate us all. The amenities are great and it really felt like a home away from home. Location was excellent for us, close enough to Arosa for skiing but also great hiking possibilities from the doorstep. The owners and caretaker were very helpful and friendly and we will definitely be back! we had a lovely time, the house was beautiful and clean, overall an amazing holiday. It was a perfect vacation. The Chalet is very clean, comfortable, equipped with all important things and with perfect Service nearby the house. The view from the front windows of this chalet, down into the valley towards Chur and up the valley toward Litziruti and Arosa, are wonderful. However, the chalet is located just a few metres above the main road between Chur and Arosa, which means there is almost non-stop traffic noise from just before 0600 until between 2000 and 2100. This traffic includes trucks, buses, cars, motorcycles, and many are being operated by people who believe they are race car/bike drivers. Driving between Langwies and Chur is a challenge unless you are very used to mountain driving and the trip even takes some courage for the passenger. The chalet has well-equipped kitchens, with all the required cooking and preparation tools. There is HD satellite service but the TVs are old-fashioned and do not transmit the better quality picture to the viewer. The bedrooms are very small, with very little space around the beds to get in or out of bed without bumping into a wall. There was also a very limited provision of linen with only enough provided for each occupant, rather than enough for linen changes, one bath towel, one hand towel, one facecloth per person, and sheet and duvet/pillow covers for each bed which was to be occupied (and we were there for two weeks so did expect at least the offer of clean towels). The caretakers, the Ashwandens, were very friendly and convenient as they live next door. The village of Langwies was very friendly and has a good shop, the Dorfladen, and a good pub/restaurant, the Edelweiss Gasthaus. The train to and from Chur is an excellent way to travel down into the valley and the timings are extremely reliable. Hiking into the mountains was a real treat, especially with the prospect of good food and drink along the way, such as was available from the Pirigen and Heimeli. Days spent walking were terrific with fresh air and lovely vistas. Thank you for taking the time to post a review. We are pleased you particularly enjoyed the special scenery, local shop and train service, modern kitchens, and wonderful hiking on offer. We were very disappointed to hear about the noise which has never been an issue before, in fact quite the contrary, guests usually appreciate the tranquillity and the fact that deer even come as far as the front door on occasion. We did follow up immediately with Arosa Tourism who have subsequently informed us that unfortunately there was a one-off Harley Davidson and Audi Automobile outing during the period of your stay. We can only conclude you are referring to this and apologize for this exceptional event. One of the aspects of being in the mountains, is indeed the mountain roads, and although the local government of Chur continues to invest in newer and wider roads, a natural element will always remain. Bath, bed linen, and towels etc. are provided on a per person basis and guests can either use the washing machine and tumble dryer on an unlimited basis during their stay or request additional fresh linen from our caretaker at a small additional cost. We will ensure we make this information more clear to our guests in future. Out of the five bedrooms available, we have opted to put in a double bed rather than two singles in one of the rooms. In this room there is a compromise on space but guests prefer the larger bed or can choose one of the other four bedrooms according to their preference. The TVs are not flat screen but the picture quality is standard and they do show all the cable stations on offer. Whilst we advertise Cable TV and unlimited hi-speed WiFi, we don't make our guests aware that the TVs are not HD. We will consider making future guests aware of this point until the time they are upgraded. BY CAR: The property is within 1hr 30mins of Zurich by car (major airport). BY TRAIN: The train journey is spectacular in itself along the shores of lake Zurich and then 40 mins from Chur along mountain passes to Langwies. Skiing, snowboarding, cross country skiing, ski-touring, snow biking, sledging, skating, snow-shoeing, heli-skiing, hang gliding, delta gliding. Golf: Founded in 1945, the Arosa Golf Club - AN 18-hole Golf Club, and is one of the highest 18-hole course in the Alps (1800m). SKI: The Arosa ski pass also includes the train fare to Langwies station which is in walking distance of the Chalet. In winter, deer are frequent visitors in the evening, and the chalet is in walking distance of the local village amenities. Also, 15 minutes away towards Chur is ski resort of Hochwang. Almost always sunny, small but unclutterred runs (on piste and off piste) through the trees. Experience skiing how it used to be ! Prices include bed and bath linen, all beds made on arrival, resort tourist tax per person per night, chalet end-cleaning, unlimited high speed wifi, multi-language Cable TV, and fire wood. Normally Changeover day is on a Saturday during the Summer or Winter seasons, if you would like to changeover on a different day in Spring or Autumn, please contact the owners. We ask that renters leave the chalet in a similar tidy and clean fashion condition that it was rented out to them. Should the cleaning take more than the standard time required this will be taken out of the deposit. Thank you for your understanding.